Other amenities include DVD rental, cabins, and store. Handicap accessible. Park is member of Good Sam. 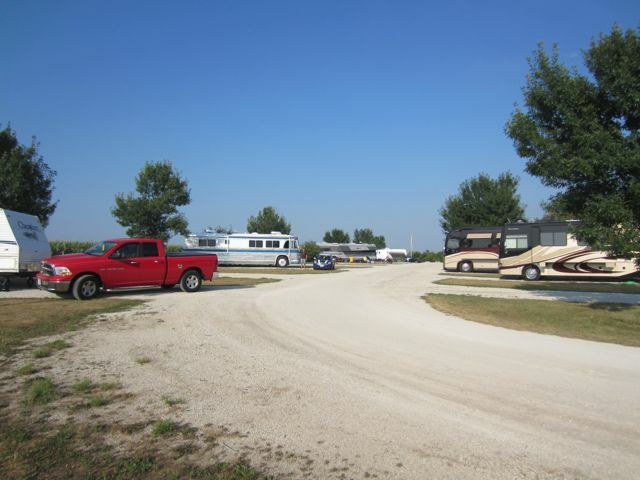 Probably the nicest RV park in the area. Convenient to both interstates and all 3 state parks nearby are easily accessible. Love's Travel Plaza right off the interstate exit too, right on your way to the RV park. Generously spaced sites, some have concrete pads and others are gravel. Picnic table and a fire ring at every site. Didn't need to level our travel trailer on our site but some visitors do have leveling pads in use. Mostly very level sites throughout the park. Very clean all around the place, they must work hard to keep it that way and keep the trash containers emptied regularly. There is some noise from the interstate highway but it's mostly a slight background noise; we've been to parks much noisier. Wifi is complimentary and worked really well both nights we spent here. A handful of over-the-air television stations but none are the major networks and the park does not offer cable television service. The satellite antenna works well here, and many of the RV's here have satellite antennas in use; be sure to ask for a site with a clear view to the south when making reservations. We stayed here in a travel trailer, and yes would return for a second visit. Daily rate listed below reflects Good Sam discount. Very clean and convenient stopover if traveling I-80 (or coming up I-39 ). Good layout for utilities and a nice level site. Very nice, clean and well kept. Level, gravel pull thru with nice grass. Not all that noisy.got crowded in weekends since it was Spring.out in the H section by cornfield is less crowded & during the week I had it all to myself.wi if only worked up at office .staff very nice.Bathrooms clean.glad of laundry.i stayed an extra 5 days I liked it so well.gave me Escapees & Good Sam discounts back to back.moved over to no sewer area to save $.It was in E-4 & more crowded, but I got on end w/ lots of grass on one side.This park has lots of pretty grassy areas. Nice clean park with big spaces, a pool and plenty of room for big rigs but if you like to sit outside in the evenings this is not the place for you. The road noise from the interstate is very, very loud and unpleasant. After being disappointed by the state parks in the area, we stumbled on this location via Passport America. They offered us a back-in site, which after a long day of driving we were happy to accept. The sites were quite spacious, and the back-ins along the J row are all along a corn field. Very quiet and away from highway noise. We loved it. Loved it so much, we decided to extend a second night. After walking around the campground, we were kinda glad a pull-thru wasn't available - the back in sites gave more sense of privacy. The hook-ups were top notch - great 50A electric, water pressure and sewer. The bath facilities were also pretty nice. The layout of the park is interesting and kinda spread out with different sections. There are some short trails connecting the sections, with a nice looking tent area in the woods. A nice arcade/game room and camp store, and the pool looked nice - although we didn't use it. All and all, with a Passport America discount - this place was a welcomed stop over spot for us. Great Verizon & AT&T signals, and the park WiFi quite usable. We'd definitely return on future traverses through the area.